Another exceptional version of this low carb classic! Beat the cream cheese until light and fluffy, but keep your mixer speed relatively low. Slowly add sweeteners and continue beating until creamy. Add eggs one at a time, incorporating after each addition. Add vanilla and yogurt and mix just until well blended (don't overmix). Wrap outside of spring-form pan (with crust) well with foil (heavy is best) to prevent crust from burning. Make sure this is done in one large piece to keep water out. Pour cheescake filling into bottom of crust, reserving ½ cup of filling. Add LC-Cranberry Sauce or LC-Preserves. Add remaining ½ cup of filling and swirl in fruit with a fork to look nice. 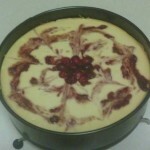 Place cheesecake onto another pan with sides and place into oven. Carefully pour 2-3 cups of very hot water into outer pan until the water is about ⅓ the way up the spring-form pan. At the end of hour, turn oven off and leave cheesecake in oven for 1 more hour. At no time open the oven door or disturb. 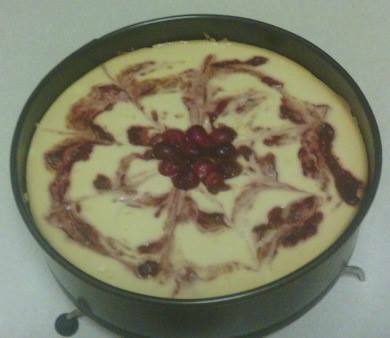 When second hour is up, remove cheesecake from oven, remove foil and refrigerate until completely cooled, 4-6 hours. Remove spring-form sides and enjoy!